A baby swing can be an invaluable tool to a new parent. Many babies crave the motion that they find so soothing as it reminds them of the womb, yet new parents need a break from time to time to catch a shower or a chance to eat. Whether your baby is just a little fussy or whether she suffers from a massive case of colic, you might be amazed at how well a swing can soothe her. Baby items that pull double duty can help you save money and space, and the Graco DuetConnect LX Swing and Bouncer does just that. The seat of the swing lifts off to become a bouncy seat that is easy to carry with you from room to room. It includes two vibration speeds and is appropriate for babies up to 18 pounds. The seat also clicks into two different recline positions and includes head support that cradles tiny babies in just the right way but removes to accommodate growth. The swing can be used with babies who weigh less than 30 pounds and features six side-to-side speeds, ten classic melodies, and five soothing nature sounds. Three sweet plush toys hang from the overhead mobile and sway gently with the movement of the swing. The swing can be powered by D-cell batteries or an AC adapter that can be plugged into an outlet, but the vibrating function can only be powered by batteries. The DuetConnect comes in three designs (Solar, Finley, and Manor) that offer neutral colors which effortlessly match your home decor. This swing also combines two common baby gear items into one model to give you a versatile item that will help you care for your baby. Set baby swinging or click the swing into lock mode for a seat that can vibrate. The head-to-toe swing runs on five different speeds that are powered with Whisper Quiet technology so you won’t have to deal with annoying bumps. Additional features that help to keep baby happy include eight melodies, three nature sounds, and a pivoting toy bar that comes with one hanging toy as well as three loops for additional toys. This swing is powered by four D batteries but is equipped with Hybrid rive Technology which can help your batteries last up to three times longer than similar models. A swing timer is included to set the swing to halt at either 30, 45 or 60 minutes so that you don’t need to remember to turn the swing off to conserve energy while baby sleeps. The slim-fold design folds flat and is easy to carry which makes this swing perfect for small spaces or families on the go. Appropriate for babies up to 20 pounds, the ConvertMe Ridgedale Swing-2-Seat comes in a variety of colors that include sweet embroidery and delightful details to keep both you and baby happy. This front-to-back swing features the unique ability to mimic the movement of a nursery glider so that your baby will feel just as if he is in your arms. While offering all of the benefits of a full-size swing, the Glider LX features a compact design that won’t take up unnecessary room in your living space. Additionally, a timer mode is available to extend battery life. A variety of features are included to help soothe and comfort your baby including six gliding speeds, two vibration speeds, three recline positions, five nature sounds, and ten classic melodies. An adjustable toy bar gracefully arcs over the swing and dangles two toys at just the right level to interest your baby and promote brain development. This swing’s vibrating feature can only be powered by a D-cell battery, but all other features, including the gliding motion, can be powered by an adapter cord that plugs into a wall outlet. Suitable for use with babies up to 30 pounds, the Graco Glider LX Gliding Swing is available in two cozy colors. This swing offers a game-changing feature that adapts to your baby’s preferences: the ability to swing both side-to-side and head-to-toe! Many parents find this to be a valuable option as some babies seem to prefer one motion over the other, and swings that function in a single direction may not be the one your baby prefers. Simply press a button and rotate the swing to change directions. The design takes the comfort of your baby into consideration and includes two recline positions, a body insert, head support and a removable machine-washable plush seat pad that you will really appreciate in the event of a blow-out. Sixteen soothing audio options are included, as well as six swing speeds so that you can choose the best settings for your little snuggler. A motorized mobile featuring three cute creatures and a mirrored dome gently spins to encourage baby’s development. The options extend even to the power source, as this swing can operate on batteries or an outlet plug-in. The only drawback of this model is that the weight limit is lower than similar models at 25 pounds, and some customers note that the swing starts to make a louder noise as your baby grows heavier. If simple and sweet is what you need, the Graco Simple Sway is the model you are looking for. The small footprint tucks conveniently into any room so that baby can stay near you, and the swing offers the option to plug into an outlet instead of using batteries. Six side-to-side swinging speeds and two speeds of vibration will help calm your baby, and the fifteen songs and sounds are an added bonus. A mobile featuring three soft stars will delight your little one as they gently dance with the swing’s motion. The deep plush seat allows your baby to snuggle in and feel secure, and charming, soft fabrics are used to add a touch of whimsy to the neutral design. Three color schemes are available: simple gray Abbington, bright pink Kyte, or pastel green/blue Stratus. The Simple Sway can be used with babies who weigh less than thirty pounds and features an easy-to-use five-point harness for added safety and peace of mind. Some reviews note that the infant head support is not as sturdy as other models, but the seat inserts do have the benefit of being removable and washable. 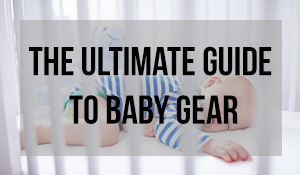 There’s a good reason that a swing is considered an essential baby gear item. It not only calms your baby with its gentle motion, it also provides a safe place to put your baby down. Young babies crave stimulation but are not yet able to explore their world without the assistance of a caregiver. Swings often include lights, sounds, and toys that are perfect for supporting your little one’s development. Many parents put a baby swing on their registry so that loved ones can gift it to them at a baby shower. It’s best to have your swing as soon as your baby comes home from the hospital, as those first newborn days can be rough. The swing can help provide the soothing motion that they are used to so that you can catch a break when you need it. Baby swings come with weight limits that can help you decide when to retire this item, but generally, you can use a swing until your baby starts trying to sit up in it which is typically around six to nine months. When you are looking for a baby swing, there are a few things to consider as you look at the different features that each swing offers. Swings vary in size, so you might consider if you need a smaller model that won’t take up too much room in your home. Travel swings that can fold up are also available if you want a model that can be easily transported to grandma’s house, for example. While some swings can only be powered by batteries, some parents find this inconvenient and expensive and opt for models that can be powered by plugging into an outlet. Another great option that you might appreciate is a swing timer that sets the motion to turn off at different time intervals. While many features are optional and depend on your preferences, there are a few that are essential. Make sure your swing comes with a five-point harness so that your baby will be kept safe and secure in the swing. Head support is also vital to proper positioning when you are using a swing with a newborn.